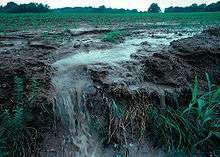 Surface runoff, also called nonpoint source pollution, from a farm field in Iowa, United States during a rain storm. Topsoil as well as farm fertilizers and other potential pollutants run off unprotected farm fields when heavy rains occur. A pollutant is a substance or energy introduced into the environment that has undesired effects, or adversely affects the usefulness of a resource. A pollutant may cause long- or short-term damage by changing the growth rate of plant or animal species, or by interfering with human amenities, comfort, health, or property values. Some pollutants are biodegradable and therefore will not persist in the environment in the long term. However the degradation products of some pollutants are themselves polluting such as the products DDE and DDD produced from degradation of DDT. Pollutants, towards which the environment has little or no absorptive capacity are called stock pollutants. (e.g. persistent synthetic chemicals, non-biodegradable plastics, and heavy metals). Stock pollutants accumulate in the environment over time. The damage they cause increases as more pollutant is emitted, and persists as the pollutant accumulates. Stock pollutants can create a burden for future generations, by passing on damage that persists well after the ‘benefits' received from incurring that damage; have been forgotten. Fund pollutants are those for which the environment has some absorptive capacity. Fund pollutants do not cause damage to the environment unless the emission rate exceeds the receiving environment's absorptive capacity (e.g. carbon dioxide, which is absorbed by plants and oceans). Fund pollutants are not destroyed, but rather converted into less harmful substances, or diluted/dispersed to non-harmful concentrations. The night sky viewed from Luhasoo bog, Estonia with light pollution in background. ecological light pollution which describes the effect of artificial light on individual organisms and on the structure of ecosystems as a whole. Pollutants can also be defined by their zones of influence, both horizontally and vertically. The horizontal zone refers to the area that is damaged by a pollutant. Local pollutants cause damage near the emission source. Regional pollutants cause damage further from the emission source. The vertical zone is referred to whether the damage is ground-level or atmospheric. Surface pollutants cause damage by concentrations of the pollutant accumulating near the Earth's surface Global pollutants cause damage by concentrations in the atmosphere. Pollutants can cross international borders and therefore international regulations are needed for their control. The Stockholm Convention on Persistent Organic Pollutants, which entered into force in 2004, is an international legally binding agreement for the control of persistent organic pollutants. Pollutant Release and Transfer Registers (PRTR) are systems to collect and disseminate information on environmental releases and transfers of toxic chemicals from industrial and other facilities. The European Pollutant Emission Register is a type of PRTR providing access to information on the annual emissions of industrial facilities in the Member States of the European Union, as well as Norway. Clean Air Act standards. Under the Clean Air Act, the National Ambient Air Quality Standards (NAAQS) are developed by the Environmental Protection Agency (EPA) for six common air pollutants, also called "criteria pollutants": particulates; smog and ground-level ozone; carbon monoxide; sulfur oxides; nitrogen oxides; and lead. The National Emissions Standards for Hazardous Air Pollutants are additional emission standards that are set by EPA for toxic air pollutants. Clean Water Act standards. Under the Clean Water Act, EPA promulgated national standards for municipal sewage treatment plants, also called publicly owned treatment works, in the Secondary Treatment Regulation. National standards for industrial dischargers are called Effluent guidelines (for existing sources) and New Source Performance Standards, and currently cover over 50 industrial categories. In addition, the Act requires states to publish water quality standards for individual water bodies to provide additional protection where the national standards are insufficient. RCRA standards. The Resource Conservation and Recovery Act (RCRA) regulates the management, transport and disposal of municipal solid waste, hazardous waste and underground storage tanks. A tank or piping network that has at least 10 percent of its volume underground is known as an underground storage tank (UST). They often store substances such as petroleum, that are harmful to the surrounding environment should it become contaminated. Look up pollutant in Wiktionary, the free dictionary. 1 2 3 4 5 6 Tietenberg, T. (2006). Economics of Pollution Control, Chapter 15 in Environmental and Natural Resource Economics, 7th Edition, Pearson, Boston. ↑ "NAAQS Table". Criteria Air Pollutants. Washington, D.C.: U.S. Environmental Protection Agency (EPA). 2016. ↑ EPA (2016). "Effluent Guidelines." ↑ U.S. Resource Conservation and Recovery Act. P.L. 94-580, 42 U.S.C. § 6901 et seq. October 21, 1976. Amended by the Hazardous and Solid Waste Amendments of 1984, P.L. 98-616, November 8, 1984. ↑ "Marine Dumping". CatN. Retrieved October 8, 2013.